In March of 1875, at least three tornadoes touched 18 counties in the state of Georgia. In Harris county, at least six members of the Capt. 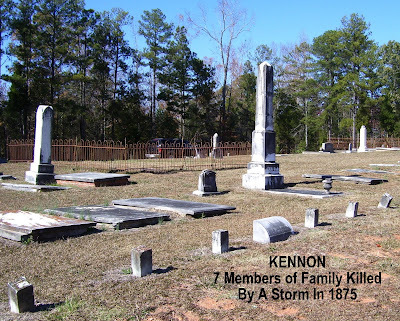 John H. Kennon family were killed. They were laid to rest in the Waverly Hall cemetery. An account of the disaster in the 30 March 1875 Macon Weekly Telegraph says this: "...At Mt. Airy, the house of Capt. John Kennon was whirled around, and portions of it carried half a mile. 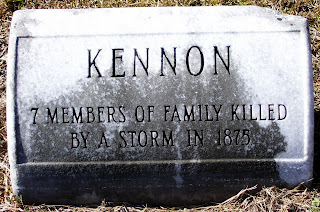 Mrs. Kennon was killed with her two grown daughters, a son aged seventeen, a daughter of twelve, and a baby. Their bodies were scattered along the road for 50 to 150 yards, and everything else was gone. The bones of all were broken and they had received severe gashes..."
Here is an additional article that describes more of the storm. I transcribed the whole article for those that might have genealogical interests. After this transcription is a link to even more articles from other newspapers detailing the destruction of the storms. COLUMBUS, GA, March 22 -- Storms occurred Saturday between 11 and 12 o'clock. There appeared to be four whirlwinds, or tornadoes, one near Whiteville, in Harris county; another from Harris county into Meriwether; another near Hamilton, and another from Harris through Talbot. The two first created immense havoc to property, but no lives were lost; the one near Hamilton killed three children of H. W. Pitts, and badly wounded two others, one having both legs, both arms and a thigh broken, and injured Pitts and his wife. The latter is bereft of reason from grief. Every house on its course, for twenty miles in length and a half mile in width, was levelled, trees blown down and carried hundreds of feet, and fences scattered everywhere; furniture, clothing, stock, etc, all gone, and the people suffering on account of the destruction of food. The fourth was most destructive, for, twenty miles in length and half a mile in width, its path is marked by ruin and devastation. The little village of Mount Airy, in Harris county, was totally destroyed; not a house standing. The wife and five children -- four grown, three of which were young ladies -- of Capt. J. H. Kennon were killed and their bodies blown from fifty to one hundred yards, and Captain Kennon was hurt in the shoulder. Two of his sons were saved, being absent from home. Mr. Hunt was injured in the spine, Wm. McGhee had two ribs broken, and goods and clothing scattered all around; Maj. John H. Walton escaped narrowly, his residence being demolished; teacher Clark and wife are mortally wounded, and their child had an arm fractured; rev. J. B. McGhee had his jaw broken, and was injured internally; his daughter and son injured; Tom Neal was hurt and his house utterly blown away. Baughville, Talbot county, was completely demolished. Elisha Culpepper was killed, and his wife and daughter-in-law was seriously wounded, and Mrs. Burdell had both legs broken. Among others badly hurt are Mrs. Miller B. Phillips, Mrs. Bradshaw and son, a daughter of Prof. Chaplin, and a son of Capt. C. Calhoun, in all ten whites and sixteen negroes killed and five churches demolished, six stores and four school houses destroyed. Total loss over one hundred thousand dollars. Columbus has voted four thousand dollars to the sufferers. Hamilton and Talbotton escaped by a mile and a half. Direction of the storm was northeast. A gentleman came in on the Southwestern train this morning for six coffins for one family -- that of Capt. John Kennon, his wife, three daughters, and two sons." Read even more accounts of the devastating storm here.